National Drumming Day is November 15th - Do you tap out rhythms on your desk or air drum along to your favorite rock song? Maybe you know a drummer that plays in the school band or on the big stages. 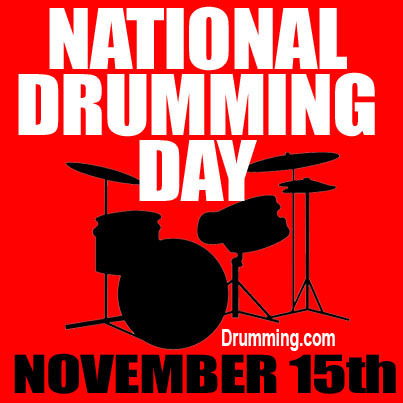 November 15th is the day we celebrate DRUMMING- throughout the nation. 4. Revisiting your drumming goals and making sure you're still on track. 5. Setting up a drum club using the 'drumming' theme to help 'at risk' school kids. 6. Calling in sick. Tell your boss it's National Drumming Day. 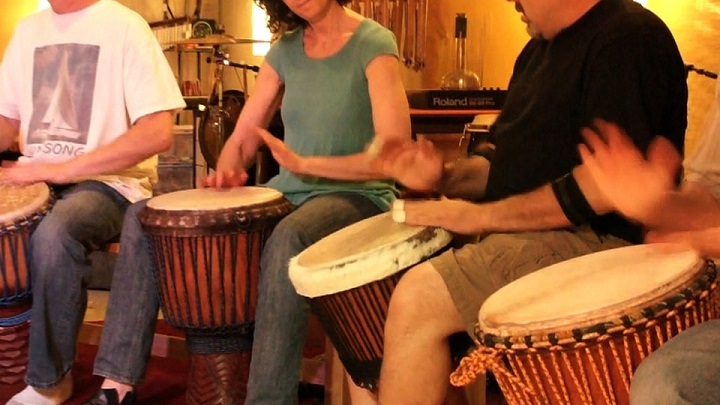 The history of National Drumming Day: This special drummer day was created by the proprietors of Drumming.com. Upon building this website, it was realized that there was no special day particularly for drumming. There were 'months' dedicated to percussion but not one particular day that we could call our own. It only seemed fitting that we designate that official day. Not to be outdone by National Coffee Day and National Cheeseburger Day (yup, you heard right), DRUMMING can now join the ranks of "official" days on the national calendar. Grab your drum and let's go! Need Gift Ideas for National Drumming Day? When is National Drumming Day? It's November 15th of every year. Drumming is thought to have started as early as 6000 BC as scientists discovered cave drawings of Peru Indians with drums. Nearly everyone can relate to drumming. It's seems almost a primal instinct to beat out rhythms as we feel them internally. If you give someone a couple of sticks and a drum, they're usually able to put together some kind of rhythmic pattern. There is drumming in all of us! Chat about National Drumming Day at DrumChat.com. Drum Chat is one of the most popular drumming forums online with thousands of members and over half a million posts! From drum lessons to videos to finding the just the right drum, there is a plethora of knowledge at DrumChat. It's free to join and open to everyone. Definition: The word drumming is often used in the phrase "drumming up support" or "drumming up business" to suggest making something happen. But the dictionary defines this word more in the literal sense; "to play on a drum" or to "make a continuous rhythm". With the exception of a person that might nervously beat their fingers repeatedly on a desktop out of anxiety or simply to play along with a song, drumming most often refers to anyone that either makes a living playing drums as a drummer or just uses drumming as a hobby. The passion is there regardless and we celebrate this passion on our special day, November 15th of every year. Start pounding the table with your fists as loud as you can. When someone asks what you're doing, tell them it's National Drumming Day! Related: 2016, 2017, 2018, 2019, 2020, when is national drum day? Celebrate Drums and Drumming on our Special Day!